Chapter 1 introduced the problem that cognitive assessment used to evaluate both prepared and underprepared students entering college is not a reliable assessment of underprepared students (Moore, 2007; Schmitt et al., 2009; Sternberg, 2008). Sternberg (2010) noted an accurate way to assess underprepared students is to use a variety of measures such as noncognitive (i.e., creative & practical skill) measures, Scholastic Aptitude Test (SAT) measures, and grade point average (GPA). Moreover, Heckman (2008) argued teaching noncognitive skills is a more cost-effective way to enhance cognitive skill training for underprepared students. The purpose of the study was to discover through the exploration of lived experiences, the influence of noncognitive factors on students’ academic preparedness. Chapter 2 involves a discussion of historical factors contributing to the research problem, present, and past studies relating to noncognitive factors, and opposing views concerning constructs of intelligence and the SAT assessment. The review includes issues primary to why noncognitive factors are not included for academic developmental assessment within community colleges, which may provide a better understanding of the present condition in public higher education. The literature review includes Vygotsky’s developmental law to understand his viewpoint on intelligence. In Chapter 2, the review includes the topics of: (a) historical overview of the problem, (b) historical significance of noncognitive factors, (c) significance of intelligence theories, (d) developmental education, (e) and literature gaps. Reference sources used for the literature review included: peer reviewed journals, electronic books, and electronic dissertations. Databases used from University of Phoenix online library, which included: ProQuest, ProQuest Dissertations and Theses, and Books24x7. Some keywords for search terms were: unprepared college students, noncognitive factors, general intelligence, multiple intelligences, successful intelligence, and Vygotsky. 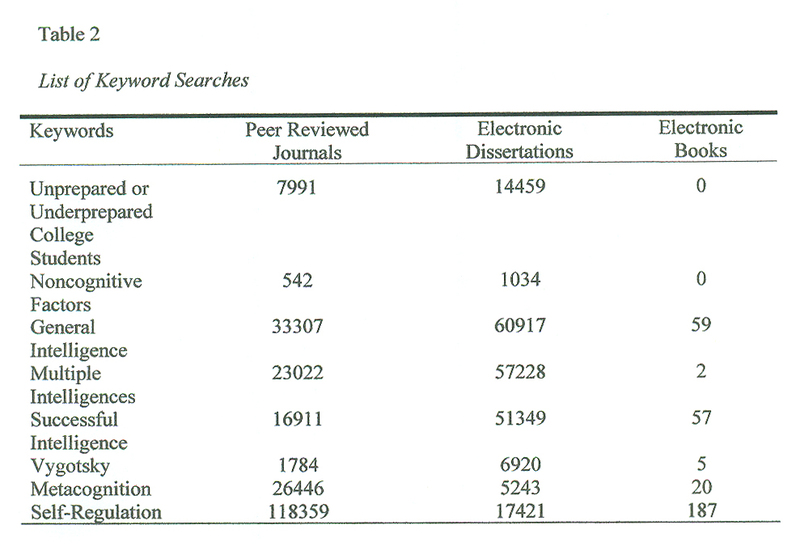 The keyword searches in Table 2 targeted a 5-year publication date (i.e., from 2006 through 2011). The development of academically underprepared college students began in 1636 with Harvard offering preliminary support for Latin and Greek language students studying for the ministry (Doninger, 2009; Mulvey, 2008). During the 1800s, a small proportion of the total population in the United States (U.S.) attended college with most students taking preparatory courses in high school to prepare for college (Syverson, 2007). The academic preparedness of students during this period was an indication of future success in college, and it was largely a measure of their GPA score (Geiser, 2009). Mulvey (2008) noted by the mid-1800s, admission requirements began to change and become more thorough because of an influx of underprepared students entering college as a result new federal laws. The federal Morrill Act of 1862 and 1890 created more access to diverse gender and ethnic students and more demand for academic help (Mulvey, 2008). Mulvey (2008) explained by increasing federal funds to states that the Morrill Act of 1890 prohibited discrimination in states receiving these funds on which created an additional demand for academic help for the academically underprepared students. In 1900, 12 colleges began to standardize college entrance examinations creating the College Entrance Examination Board (Syverson, 2007). Sternberg (2010) reported that the name became the College Board in 1901, and the enterprise became better known with the introduction of the SAT in 1926. Geiser (2009) noted the focus before the SAT assessment was primarily on students’ high-school achievement using their GPA. The SAT is an analytic ability (i.e., cognitive) test that has become an essential part of college admissions because it is meant to predict academic preparedness for future success in college (Geiser, 2009). According to Geiser (2009), whereas achievement scores are the grades the students receive for their academic subjects, analytic scores (i.e., SAT) measure their potential ability to learn, known as academic preparedness. Gottfredson and Saklofske (2009) confirmed the SAT is an assessment of academic preparedness for entry into college. The analytic or SAT assessment closely resembles the Intelligence Quotient (IQ) test (Gardner, 2006). In brief, according to Syverson (2007), the SAT uses similar questions. The correlation between the SAT and the IQ test suggest that the two tests are very similar (Sternberg, 2010). Geiser (2009) argued that the SAT is not a valid indicator as a predictor of student achievement and may have an adverse result on underprepared students such as minorities and low-income students. Incidentally, these academically underprepared students such as minorities, the poor and single mothers, and immigrants were not considered for college in the past (Boylan, 2008a). Geiser (2009) argued that students’ achievement associated with their GPA is more accurate for assessing these students’ academic preparedness for college than using SAT testing. In 1959, Syverson (2007) explicated because SAT testing was seen as mainly for elite institutions that development of American College Test (ACT) was in response to this perception. Sternberg (2007b) argued colleges can reach academically underprepared college student populations by expanding the SAT and ACT to include noncognitive factors such as creative and practical skills. Gottfredson and Saklofske (2009) noted the trend in research is to find ways to partner cognitive and noncognitive viewpoints to understand cognitive competencies. Heckman (2008) reported the ability to measure noncognitive skills are just occurring within the 21st century and evidence is beginning to confirm that college students can improve cognitive skills training by primarily focusing on their noncognitive skills. Heckman (2008) noted these noncognitive factors as social-emotional regulation, personality, and motivation as well as willingness to communicate with others. Moreover, because of open admission policies, the issue of academic underpreparedness has grown. Open admission policies based on the assumption that academically underprepared students would do well in college if they had additional cognitive development in math, reading, and writing (Biegel, 2009). According to Doninger (2009), the Higher Education Act of 1965 was the result of a need for more access, which reflected an American belief that everyone should have the opportunity for higher education. Tinto (2007) reported before the 1970s students dropping out of school was an indication of low motivation, low willingness, and low abilities. After the 1970s, Tinto (2007) noted that this view shifted in recognition of the role of the educational institutions as well as the students’ environment in making a decision to remain in or drop out of higher education. Taylor-Mendoza (2010) and Dowd (2007) reported that open admission community colleges are the gateway through which most underprepared students reach higher education; nearly 40% of the population in 2006 or eight million undergraduate students enrolled in community colleges. However, Engstrom and Tinto (2008) argued that providing access to education without providing adequate support is, in essence, offering little opportunity. Boylan (2009) noted these students may perform better academically if community colleges used both cognitive and noncognitive factors in assessments to provide targeted interventions. Dowd (2007) reported that with minimal requirements for enrollment and low tuition community colleges serve as gateways of open access for 2-year degrees, 4-year college transfer, or developmental education. In 1901, the Joliet Junior College became the first community college, created by William Harper and Stanley Brown in response to the need for a trained workforce because of an increase in high-school graduations (Dobbins, 2008). During 1920, Jurgens (2010) reported 74 community colleges existed in the U.S. and by 1950 the number increased to 330 community colleges. Between the GI Bill in 1944 and the rise of community colleges throughout the 1970s, attendance at these colleges grew at a remarkable pace (Dobbins, 2008). According to Jurgens (2010), the community college enrollment in 1965 was nearly one million, increasing in 1970 to more than two million, and by 1980 the enrollment increased to more than four million students. Jurgens reported by 1990 there were 1106 community colleges, and by 2010 there were 11.6 million students attending 1202 community colleges. Bueschel (2009) noted the community colleges were victims of a successful growth rate as open access policies encouraged an ever-growing underprepared population of students to attend college. Boylan and Bonham (2007) explained during the late 1970s that few policymakers at the federal or state levels were discussing how to improve developmental education policies, thus creating better services at community colleges. However, 21st century state legislatures and other policymakers started to recognize the importance of developmental education in community colleges as the path toward higher education for academically underprepared college students (Boylan & Bonham, 2007). Academically underprepared college students are at-risk to fail and mostly consist of first-generation students (Ramirez, 2009). According to Ramirez, first-generation students are students in which neither their grandparents nor parents have obtained a college degree. First-generation students are thought to lack persistence because of unfamiliarity with the new environment and lack support from their parents who have no experience with the college environment (Hand & Payne, 2008). Henderson (2009) characterized first-generation underprepared students as having failure expectations, little family support, and limited understanding of what it takes to experience academic success before beginning college. Ramirez (2009) noted the developmental objectives should emphasize noncognitive factors like personal, emotional, and social development to help academically underprepared students. Heckman (2008) reported through a study on social-economic outcomes emanating from educational attainment that both noncognitive and cognitive skills are important for educational outcomes. Schrader and Brown (2008) reported empirical researchers over several decades showed 50% of students in community college are not completing their degree attainment. Cragg (2009) noted “research in this area has found that first-generation college students are less likely to persist” (p. 397). Nevertheless, Hand and Payne (2008) suggested that 4-year institutions are reliant on students of first-generation and 4-year institutions should invest in their retention. Further, Jurgens (2010) reported nearly 50% of the graduates from 4-year institutions are students beginning their educational aspirations through community colleges. Community colleges provide higher education opportunities through open access to students underprepared for college-level courses (Moss & Yeaton, 2006). Boylan (2008a) noted that providing opportunity is not sufficient to deal with academically underprepared students, who may require development and training to take advantage of the opportunity. The more integrated students are in activities at the college the more likelihood they may not drop of school (Barbatis, 2010). Boylan (2008a) reported nations around the world have the same problem as the U.S. (i.e., not enough educated citizens are available to handle 21st century challenges). Bailey (2009) argued for removing the separation of underprepared college students from college-prepared students by incorporating support for every student. Bailey also argued rethinking assessments used to understand underprepared college students’ needs. Bowman (2009) reported that by 2023, at least 50% of 18 year-old students in the U.S. may be from minority groups. Students may benefit from the knowledge that noncognitive factors like low self-perception and perceived lack of power in their lives are affective factors that can reduce their academic potential (Hall, Smith, & Chia, 2008). During the 21st century, researchers began finding ways to incorporate noncognitive factors with cognitive factors for assessment of underprepared college students. Sternberg (2007a) argued that intelligence is not localized to just within the brain but involves the ability to adapt to noncognitive environmental challenges. Sternberg (2007b) reported that many scholars have dealt in the past with the relationship between education, culture, and intelligence. However, Sternberg (2007b) also reported the theory of successful intelligence is a way to explain how students compensate for their weaknesses and adapt to their environmental challenges. Sternberg et al. (2010) suggested that diverse gender and ethnic groups of individuals may have challenging cultural environments to overcome; consequently students may develop practical and creative skills to survive their environment. To measure noncognitive factors, researchers are incorporating self-report questionnaires. Schmitt et al. (2009) conducted a study in which self-report questionnaires (i.e., noncognitive assessment) was to augment the SAT assessment. Sternberg (2010) also conducted studies known as the Rainbow and Kaleidoscope on which self-report questionnaires was to augment the SAT assessment. Boylan (2009) incorporated noncognitive (i.e., affective & personal) factors with cognitive factors to develop targeting interventions. However, Lindqvist and Vestman (2011) noted noncognitive measures such as self-report assessments lack validity compared to the IQ tests. The shifting interest from cognitive measures to noncognitive measures for tests is the result of a shifting focus from selection and placement toward educational practice such as instruction and counseling (Gottfredson & Saklofske, 2009). Boylan (2009) used affective factors to assess if the students had determination, autonomy, and the willingness to seek help as well as work hard on assignments. According to Boylan (2009), most community colleges in the U.S. consider these noncognitive factors as important as cognitive skills to obtain academic preparedness. Bailey (2009) argued “developmental education as it is now practiced is not very effective in overcoming academic weaknesses” (p. 12). Boylan (2009) urged community colleges to use assessments that triangulate affective factors with cognitive and personal factors for targeted interventions to help academically underprepared college students. Sternberg (2008) focused on practical (i.e., implementing ideas) and creative skills (e.g., generating ideas) as noncognitive factors necessary for life-skills. For example of creativity, Sternberg (2010) asked students to write a short story about designing advertisements or creating a product, with a question focused on practical issues querying students about persuading someone else against an unpopular idea. He also noted that testing should include SAT scores, high school GPA, writing, and a face-to-face interview as a holistic assessment of academic preparedness. Griffin (2008) focused on personal factors such as a missing, unemployed, or illiterate parent as risk factors for students dropping out of school. In this Griffin’s study, the Annie Casey Foundation is the source for identifying these personal at-risk factors. This study focused on returning adult high-school dropouts and finding an effective way of providing them with a second chance (Griffin, 2008). As well, Boylan (2009) noted personal factors such as childcare responsibilities and language barriers can influence homework study habits. Other researchers such as Fewell and Deutscher (2004) determined that early educational factors or maternal responsivity (i.e., the communication between mother and child starting from birth) are influential noncognitive factors toward academic preparedness. Fewell and Deutscher (2004) included four variables with four multiple regression analysis to determine if the mothers’ early facilitation of their children’s speech capability were salient to enhance academic preparedness. According to Fewell and Deutscher, early language formation was found to be the foundation of literacy, reading skills, and therefore academic preparedness. Additionally, Mathews (2010) explored early educational factors at the high school level to understand ways that apathy affected students. Mathews (2010) discovered many students were found to be bored for a variety of reasons. McIntosh and Munk (2007) noted the attainment of an education can be a decisive factor in social settings and in determining an individual’s economic potential. Heckman (2008) suggested that a lifetime of lost earnings is often relative to an individuals’ home environment, which form an individual’s potential by the age of 18 years. Schrader and Brown (2008) discerned that when underprepared students do not integrate successfully into education, this can decrease revenues and resources for the community. High-attrition rates are affecting colleges’ economic vitality (Barbatis, 2010). According to Huffman (2009), the U.S. may have lost hundreds of billions of dollars annually directly related to the academic underprepared and academic prepared educational gap. Although cognitive abilities play a vital role in determining economic success, noncognitive factors such as persistence, self-confidence, and motivation are equally important in determining economic success (Heckman, 2008). In agreement, Boylan (2009) reported noncognitive factors are equally important to college students’ academic preparedness as cognitive skills. When academic advisors expand cognitive assessment data with noncognitive information, the ability to focus interventions to help students also increases (Boylan, 2009). Research is beginning to indicate that the SAT used alone is a poor predictor of underprepared college students’ academic preparedness (Deil-Amen & Tevis, 2010). In studying the relationship between high IQ scores and noncognitive skills, Borghans et al. (2008) discovered the behaviors like self-discipline and motivation are essential noncognitive factors affecting cognitive test scores. Another study focusing on persistence suggested that an individuals’ grit (i.e., perseverance) accounted for successful educational retention (Duckworth, Peterson, Matthews, & Kelly, 2007). The researchers determined that using one noncognitive aspect called grit can demonstrate predictive validity beyond the IQ test (Duckworth et al., 2007). Using another vantage point to understand the influence of noncognitive factors, Dawson (2008) reported animal studies have demonstrated that attention such as licking by a maternal rat produce changes in deoxyribonucleic acid (DNA) and brain structure as a gene expression regulation. A similar occurrence within the human brain is sensitivity to traumatic events in early childhood causing emotional issues, lack of attention, and language delays (Bierman et al., 2008). In a genotype versus environment investigation of 839 twin pairs on cognitive aptitude, Harden, Turkheimer, and Loehlin (2007) suggested stronger environmental influences within low-income homes and stronger genetic influences within high-income homes. In essence, 21st century researchers using empirical evidence are beginning to demonstrate ways that noncognitive factors affect students’ academic preparedness in low-income homes as a result of environmental influences. Burlison et al. (2009) noted the SAT and ACT entrance examinations are valid measures of academic preparedness taken during college placement. The IQ tests is a good cognitive assessment measure for assessing analytical skills and memory but these skills are only a small number of skills necessary for college preparedness (Sternberg, 2010). The creators of the IQ test in the U.S. (i.e., Terman, Goddard, Yerkes, and Thurstone) were among many researchers developing a theory of intelligence during the early 1900s (Van Der Veer, 2007). Van Der Veer noted most of these researchers believed that a combination of narrow and broad cognitive abilities contributed to a general factor of intelligence (g-factor). These theorized abilities were thought to remain relatively stable throughout the individuals’ life (Kane, Oakland, & Brand, 2006). However, other researchers are investigating the notion that these abilities are not stable over a lifetime and the foundational use of g-factor in education has adverse consequences. Sternberg (2010) noted the U.S. has a closed educational system (i.e., valuing analytical and memory abilities only) in which a limited set of skills is of value deprives society of individuals with other talents. Sternberg (2010) argued this closed system has a significant foundation in Charles Spearman’s g-factor theory in which only abilities such as memory and analytical abilities are part of the resulting standardized testing. Gottfredson and Saklofske (2009) described these abilities in terms of psychological constructs based on latent traits such as intelligence and emotional stability. According to Sternberg (2010), “there are two standardized tests that have a monopoly in the college admissions market in the United States-the SAT and the ACT” (p. 41). Originally developed by Binet, the IQ test was a questionnaire that helped teachers to discover the students needing more attention (Van Der Veer, 2007). The IQ testing developed from the Binet test was initially used for: improving curriculum, selection of textbooks, and improving student academics within the classroom (Van Der Veer). The theory underpinning the IQ measurement of cognitive ability was initially to identify promising students deserving of college admission, regardless of their poor instructional background (Geiser, 2009). However, Geiser also noted under closer scrutiny that standardized testing was not giving an accurate assessment of academically underprepared students. Surprisingly, researchers know little about the way noncognitive factors and cognitive intelligence work together to determine an individuals’ academic preparedness (Duckworth et al., 2007). Vygotsky (1978) discovered many learning issues were the result of a mismatch between the dominant culture (i.e., cultural norms within public education) and the children’s natural abilities (i.e., language & home cultural norms). The implication is that academically underprepared college students may have a mismatch between their natural noncognitive talents and the public education system that values cognitive abilities. The notion of intelligence is not a well defined concept; there are contradictory points of view (Gottfredson & Saklofske, 2009; Noruzi & Rahimi, 2010). According to Noruzi and Rahimi (2010), the notion of intelligence is an abstract concept with the psychometric view of g-factor as the traditional view. The g-factor intelligence theory originates from the heredity notion of a natural transfer of intelligence (Guvercin & Arda, 2008), which later developed into a theory of measurable fixed intelligence (Piovani, 2008). With the help of a colleague, Binet made a questionnaire to identify students who needed additional help, which later led to the IQ test. Binet strongly argued against a fixed measure of intelligence (Van Der Veer, 2007). Sciences such as neurobiology, psychology, and behavioral genetics have established that intelligence may involve the interacting factors of environment and heredity (Gottfredson & Saklofske, 2009). Although some improvement is occurring, Shavinina (2008) noted the current development of intelligence theory is not sufficient to understand human intelligence. Helping the ever-growing population of academically underprepared college students may involve understanding the effects of noncognitive factors, which may also provide a more enlightened view of what constitutes intelligence (Sternberg, 2007b). Cognitive skills based on general intelligence or intelligence quotient (IQ) has one underlying aspect known as g-factor (Weel, 2008). In the tradition of Binet-Spearman, Gardner (2006) noted the prevalent thought was that cognitive knowledge is evident at birth and unchanging regardless of the individuals’ environment. Gardner (2006) also reported that the IQ test grew into a more sophisticated test known as the SAT. Jolly (2010) reported that between the 1920s and 1940s a shift occurred after a bitter debate between two research groups that culminated in convincing evidence a stimulating environment could have a positive effect on intelligence. The Iowa Child Welfare Research Station is one research group in the debate that believed stimulating environments can increase intelligence and the Stanford Group held the belief that intelligence is a genetic outcome (Jolly, 2010). According to Jolly, the results of the research showed that foster care environments was more influential toward children’s intelligence than genetic biological parents. Decades later during the 1960s, this research result influenced both Head Start Project and the War on Poverty, which arose as a result of environmental-enrichment studies (Jolly, 2010). In another study, Sefcek and Figueredo (2010) confirmed g-factor evidence for measures of intelligence, but they also discovered, other executive-task behaviors like impulse-control and task-shifting behaviors were distinct from g-factor abilities. Executive-task behaviors are brain functions that regulate cognitive processes by regulating emotions toward different responses (Bierman et al., 2008). Research on intentional, mental training found significant evidence that neurobiological modifications can occur within the brain (Garland & Howard, 2009). More recently in the 21st century, chemical brain imaging and magnetic resonance spectroscopy imaging and experiments with rats that examined gene-environment influence indicated that the environment can play a vital role in brain and memory development (Dawson, 2008). Vygotsky (1978) argued that an individuals’ ability to imitate problem solving activity after skills demonstrated through a more knowledgeable peer or adult was a more accurate measure of intelligence than independent activity. Cognitive tests (i.e., based on IQ) measure the development of independent problem-solving but the ability to imitate problem-solving activities of a more knowledgeable adult or peer is the potential development of an individual (Vygotsky). Vygotsky argued this development measured through the ability to imitate was a dynamic measure of intelligence and gave a more accurate indication of an individuals’ future academic preparedness than independent problem-solving activity measures. According to Vygotsky, the inner psychological mechanism of the learning process is largely hidden but is historically formed and culturally conveyed. However, Vygotsky revealed the prevailing psychological thought is that intelligence is a measure of an individuals’ independent activity on which current standardized cognitive testing has a foundation based on fixed intelligence. Jackson (2007) reported the concept of fixed intelligence eventually became part of the Army Alpha test. This was the first standardized test given on a national level beginning in 1917, propelling psychologists such as Terman into prominence (Jackson, 2007). Jackson also reported the Terman revised Binet-based questionnaire in 1916 had a focus on classifying students from one to five in categories ranging from the highest (i.e., gifted) to the lowest (i.e., special). Atkinson and Geiser (2009) reported that the SAT has the assumption that an individuals’ intelligence is genetically inherent and unchanging over a lifetime. The concept of fixed intelligence coincides with the concept of a fixed number of neurons within the brain as not growing; this was the general opinion held by most scientists into the 1960s (Lombardi, 2008). Since then, empirical evidence has shown that new neurons can develop within the adult brain (Von Bohlen Und Halbach, 2007). Behavioral theories dominant in the early 20th century implied that a learning environment can affect the stimuli-response of students (Schunk, 2004). The assumption was that cognitive development and teaching are conditioning processes in which the teacher creates the stimuli-response conditions for successful conditioning to facilitate the learning process (Van Der Veer, 2007). Schunk (2004) reported that connectionist theory and related experiments with humans and cats showed the learning connections increased, or decreased depending on the stimuli-response condition. Bush (2006) reported that primarily outward observable behavior was thought worthy of scientific research and the quantifiable analysis of change in behavior gave evidence of learning. However, behavioral issues like whether students should wait to be stimulated or be active participants in the education environment were primary to cognitive theory (Alkeaid, 2007). Cognitive theory research had focus on individual constructivism as opposed to social constructivism (Pegues, 2007). Van Der Veer (2007) noted that social constructivism is a view that human cognition is the product of the individual’s environment. Social-cultural cognition places individuals in significant activities that are a social construction of combining new knowledge with older knowledge (Tasker, Johnson, & Davis, 2010). Developmental law is an assertion that social interaction is the origin of higher mental processes (Vygotsky, 1978). According to Vygotsky, the mind has a social formation through social-cultural tools (i.e., language & social norms) for the development of higher mental functions. Vygotsky noted that through speech individuals may form new relationships within their environment on which leads toward new behavior and this results in the forming of intellect. What appears to be independent learning is a formation not resulting from biological capabilities but from prior social experiences (Vygotsky). According to Vygotsky, the relationship between learning and development results from imitating what was shown by a more knowledgeable adult or peer and from this the child develops behavioral control (i.e., self regulation) and learns to plan (i.e., metacognitive skills). Dunlosky and Metcalfe (2009) suggested metacognition and cognitive intelligence, as measured by IQ, are two independent entities on which students with a low IQ may compensate by using metacognitive strategies toward academic preparedness. Sanagavarapu (2008) reported two major aspects of metacognition are “knowledge of cognition and self-regulation of cognitive processes” (p. 304). Teaching self-regulation was thought to be an effective way to prevent academic underpreparedness and should begin as early as possible (Blair & Diamond, 2008). According to Vukman and Licardo (2010), self-regulation was the result of a maturing prefrontal cortex and guidance from the social environment. Jurado and Rosselli (2007) acknowledged executive functions as the area of the brain such as the frontal lobes where intellectual activity was found as the apparatus for programming intellectual activity. Moreover, another apparatus in the executive function was self-regulation, which recent research studies indicated that an individual with an emotionally disregulated behavioral (i.e. self-regulation) system may experience a decrease in metacognitive functioning (Crooks & Kirkland, 2010). Gene expression experiments demonstrated that the social environment can alter the expression of genes via the nurturing behaviors of mother rats when grooming and licking babies (Garland & Howard, 2009). Garland and Howard reported before 1998 that the prevailing views was still that the brain uses a genetic code that rendered unchanging intelligence. However, epigenetic (i.e., the science of environmental influences on gene expression) is a research area indicting that the environment can cause genetic changes in both human behavior and in the human brain (Jensen, 2008). Willis (2007) explicated research on enriched environments using chimps in one experiment and rats in another both showed through neuroimaging that the brain can grow within animals while demonstrating high intelligence performance in going through new mazes. A basic premise in the theory of multiple intelligences is that measuring intelligence with IQ or SAT does not give a complete view of existing ability (Gardner, 2006). Gardner described intelligence in terms of a bio-psychological potential for information processing is set in motion by the individuals’ social-cultural setting. Gardner (2006) proposed that multiple intelligence theory suggests a brain-body function in which the reorganization of skills and physical structure of the brain is constantly evolving through social influences. The theory of multiple intelligences indicates that individuals have many autonomous capabilities of cognition, which are each separate forms of intelligence (Gardner, 2007). Gardner (2006) referred to these separate computational capabilities as language, spatial relations, and social relations. Sternberg (2008) noted the individuals growing up within challenging environments may develop creative (i.e., generating ideas) as well as practical skills (i.e., implementing ideas) in an attempt to survive their environment. Sternberg (2009) reported the Rainbow Project study used both cognitive (i.e., analytical skills) as well as noncognitive measures (i.e., creative and practical skills), which increased a diverse gender and ethnic student population at Tufts University while SAT academic preparedness standards were not lowered. According to Sternberg (2008), successful intelligence has a framework that suggests cognitive tests of analytical skills are inadequate because of an embedded assumption, these individuals have fixed rather than flexible abilities. Successful intelligence theory incorporates a set of abilities (i.e.,analytical, creative, and practical) in which the individual has flexibility to adjust to social cultural experiences (Sternberg, 2008). Sternberg and Coffin (2010) revealed that a study at Tufts University called Kaleidoscope includes the use of the usual SAT assessment augmented with other unconventional exercises to assess practical, creative, cognitive, and wisdom abilities. During the Kaleidoscope project, introduced in 2006, the gender and ethnic mix of students entering Tufts University increased with statistically higher GPAs (Sternberg & Coffin). Research evidence showed the students who test at high-levels for creative and practical skills can achieve at higher academic levels, when taught in a manner that matches their skills (Sternberg, 2009). Schmitt et al. (2009) also demonstrated that noncognitive measures incrementally increase the assessment accuracy of freshman students’ academic preparedness during college admission when added to standard cognitive tests. Additionally, the Schmitt et al. (2009) 4-year longitudinal study sponsored by the College Board was an indication that noncognitive measures can increase the assessment accuracy of cognitive measures while increasing gender and ethnic diversity. As well, Kaufman and Dodge (2009) completed a study using 222 students to demonstrate that connectedness to teachers and importance of activities was positively related to intrinsic motivation. The Kaufman and Dodge results reflected that noncognitive factors like autonomy and understanding of goals affected students’ feelings of connectedness and value. These noncognitive factors related to intrinsic motivation have a positive association with academic persistence (Kaufman & Dodge). The indication that cognitive testing can assess every student’s academic preparedness level has not become a reality, as many situations require other skills for the challenges of life (Westby, 2007). However, Gottfredson and Saklofske (2009) reported that the Gardner and Sternberg models of intelligence have not become part of any large-scale testing in education. Basing on the premise that U.S. public education policy focuses only on cognitive testing, Heckman (2008) implied an education U.S. policy of underrating noncognitive abilities by focusing primarily on cognitive abilities. Huffman (2009) suggested the risk of maintaining a public higher education system that does not use effective practices is far too high. Huffman also suggested that although individual schools and teachers are incorporating innovations into the classroom, public education has not changed within the last 50 years. Sanagavarapu (2008) implied cognition and metacognition was a social cultural phenomenon primarily emanating from an individuals’ home environment. Jolivet (2012) reported high intensity inter-parental quarrels during divorce place children at-risk for long-term problems such as developmental vulnerability among boys and skipping school among girls. Jolivet also reported the primary issue was how the child perceived his or her relationship with each parent, as amicable divorces had little negative effect on the child. Further, Vygotsky (1978) implied the home environment provides tools in which children learn to control their impulses (i.e., self-regulation) and to plan (i.e., metacognitive skills) as the learning and development of children begins long before they enter school. Engstrom and Tinto (2008) reported that while 56% of academically prepared students may achieve a 4-year degree within 6 years, academically underprepared students have a 26% completion rate within 6 years. In a longitudinal multi-institutional 4-year study comparing developmental learning communities to prepared students, Engstrom and Tinto (2008) established that the rate of completion improved for the underprepared developmental learning community of students. Results combining 19 institutions with learning communities and without learning communities indicated 4-year colleges had a 10% difference and 2-year colleges had a 5% difference (Engstrom & Tinto, 2008). Developmental education has a policy assumption that students have academic potential but are lacking appropriate academic preparation for college-level coursework (Parmer & Cutler, 2007). One example noted by Stuart (2009) is a high school student graduating with a 3.5 GPA could not pass the entrance examination into college. After receiving targeted developmental education to prepare for college the student began majoring in physics and maintains a 3.0 GPA (Stuart, 2009). Developmental education has services at different levels to prepare students to complete their coursework (Boylan & Bonham, 2007). However, Boylan (2009) noted only 7% of community colleges use noncognitive factors combined with cognitive factors for developmental education. Boyer and Butner (2007) reported that developmental education is a hot topic for higher education policymakers at the state and institutional level. Colleges have little incentive to track the success rates of students because funding is exclusively on counting students at the beginning of each semester (Zachry & Orr, 2009). Often students possess skills that are above the requirement for high-school but fall below the entry-level college prerequisite (Bailey, 2009). Ostrove and Long (2007) reported that changing the higher education environment to understand underprepared students may play a key factor in the attrition rate of institutions. Institutions have not made the necessary gains for increasing student graduation rates by translating information about student retention into action (Tinto, 2007). In a study to identify key practices of five California community colleges, the results revealed cohesion between employees, cooperation with students, connection with departments, and consistency between programs was vital (Levin, Cox, Cerven, & Haberler, 2010). However, the way educational institutions currently organize developmental education is not effective (Bailey, 2009). Martin and Meyer (2010) noted the responsibility of educational leadership to find solutions. Ramirez (2009) shared that informal and formal mentorship programs are one way to give voice to students. Adams (2009) suggested a democratic system is vital to ensure stakeholders are part of decision-making in the educational system. Understanding the phenomenon of academic underpreparedness is possible through giving students a voice (Adams). Greenfield and Jensen (2010) added that key stakeholder perspectives can include giving voice to stakeholder stories. The premise for this is that an authentic understanding can result from a discourse about an individuals’ predicament (Greenfield & Jensen). This study used the voices of academically underprepared college students expressing their lived experiences at Northern New Mexico College (NNMC) to understand the ways noncognitive factors influenced their academic preparedness. Reid and Moore (2008) noted that research is available about academically underprepared college students but the perspective of the students is often missing. Reid and Moore also noted that these academically underprepared students are often 2 years behind starting in the fourth-grade, 3 years behind going into the eighth grade, and by the 12th grade they are 4 years behind. However, noticeably missing is a cohesive program to deal with the ever-growing population of underprepared adolescents and adults entering college. The gap in the literature is noticeable when combining different areas of noncognitive factors and discovering the ways each area of noncognitive factors influence college students’ academic preparedness. Academically underprepared college students may have an important story to tell in which a more accurate understanding may result regarding the ways noncognitive factors influenced their academic preparedness. Researchers examined specific noncognitive factors such as creative and practical skill factors relative to standardized testing (Sternberg, 2008) as well as affective factors and personal factors relative to cognitive assessments (Boylan, 2009). However, no research was found that combines many different areas of noncognitive factors to discover the influence on students’ academic preparedness. Although this literature review detailed the changing student population starting with open-access policies, the review also showed the assessment criterion, as part of the dominant culture experience, has not changed from the initial g-factor foundation of cognitive testing. Gottfredson and Saklofske (2009) reported that measuring intelligence does not require understanding how the brain works. However, Shavinina (2008) argued knowing the mental framework is necessary in developing a basis for intelligence testing. Vygotsky’s developmental law may help to provide a mental framework to understand intelligence and the ways that many noncognitive factors may influence students’ academic preparedness. The study results add to this mental framework knowledge base for future researchers by focusing on four areas of noncognitive factors to understand the phenomenon of academic underpreparedness. The literature reviewed on the influence of noncognitive factors on underprepared college students revealed the field has a variety of information on individual noncognitive factors, but little information on combining many noncognitive areas. The review revealed intelligence theory has a profound effect on public higher education and community college developmental placement. In essence, the public educational system is not ready for the opportunity afforded to students through open-access policies (Boylan, 2008b). Gardner (2006) suggested that focusing on single intelligence ability in the school system is a neglect of many other abilities the students possess. The review focused on issues primary to why noncognitive factors are not included in academic developmental assessment within community colleges by exploring the significance of intelligence theories. The review revealed that both underprepared and prepared student populations in public higher education are subject to assessment for academic preparedness based on intelligence theory emanating from the 1900s with Spearman’s g-factor. The review also revealed the developing ways to improve the SAT and ACT (i.e., based on IQ) cognitive-based testing through the addition of noncognitive factors is only just beginning within the 21st century. Chapter 2 included a summary of the influence of noncognitive factors on unprepared college students and a discussion of why cognitive assessments may not accurately assess underprepared college students’ academic preparedness. The historical overview of the problem included a discussion of: open admission policy, community colleges, and first-generation college students. The significance of intelligence theories discussed is to show that old intelligence assumption still ingrained in education may have a detrimental effect on academic underprepared college students. The chapter also included the suggestion that noncognitive factors added to cognitive testing may improve assessment accuracy of students’ potential academic preparedness. The possible cause of underpreparedness was part of the literature review. Intelligence theories illustrate how standardized cognitive testing evolved and remained as educational policy even though research shows this method of evaluating students is out-of-date. Using Vygotsky’s developmental law that social-cultural interactions is fundamental to higher mental functions was instrumental in showing possible mismatch between noncognitive natural abilities of underprepared college students and the dominant educational culture use of standardized testing. The literature discussed also explored developmental education, the historical significance of noncognitive factors, and literature gaps. In chapter 3, a discussion includes the design of the research, design appropriateness as well as revisiting the research questions. The descriptions include the sample frame, data collection with data analysis plan. Chapter 3 includes an explanation of how participants’ rights were a vital aspect of the research design. In chapter 3, a discussion on confirmability, dependability, transferability, and credibility were part of the logic behind validating the study.